The United States Army Intelligence Support Activity (USAISA), frequently shortened to Intelligence Support Activity or Mission Support Activity, and nicknamed The Activity, the Army of Northern Virginia, or Office of Military Support, is a United States Army Special Operations unit originally subordinated to the US Army Intelligence and Security Command (INSCOM) but now part of the Joint Special Operations Command. It is tasked to collect actionable intelligence in advance of missions by other US special operations forces, especially 1st SFOD-D and DEVGRU in counter-terrorist operations. "The Activity", "Office of Military Support", "Task Force Orange"
USAISA was the official name of the unit from 1981 to 1989; previously it was known as the Field Operations Group (FOG), created in September 1980. In 1989, the then USAISA commander sent a telex "terminating" the USAISA term and his special access program Grantor Shadow, but the unit continued under a series of different Top Secret codenames which are changed every two years. Known codenames included Centra Spike, Torn Victor, Quiet Enable, Cemetery Wind, and Gray Fox. After the cancellation of Operation Credible Sport, the FOG was not disbanded but enlarged. The administration saw ground intelligence contingencies as needing improvement if future special operations were to be successful (the CIA did not always provide all the information needed). So, on 3 March 1981, the FOG was established as a permanent unit and renamed US Army Intelligence Support Activity. This activity should not be confused with a later activity known as the Ground Intelligence Support Activity (GISA), as subordinated to the Army G2. The current badge depicts an American bald eagle grasping a claymore, surrounded by a kilt belt, inscribed with the Latin translation of "Truth Overcomes All Bonds". 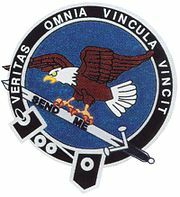 In the original crest, the claymore was wrapped in a chain with one of the links broken as a reminder of those killed during the failed Operation Eagle Claw. This symbol of failure was later deemed no longer appropriate. The badge was deliberately designed by Jerry King and other founding members of the unit because of their shared Scottish heritage. The claymore is a greatsword originating from the Scottish Highlands, and the belt surrounding the badge is seen on Scottish clan badges (the belt signifies that the wearer is a member rather than the chief of the clan - the chief wears the badge without a belt surround). In 1981 the Intelligence Support Activity began to immediately select new operators, growing from FOG's 50 people to about 100. The ISA remained extremely secret; all of its records were classified under a Special Access Program (at first named OPTIMIZE TALENT). The ISA was given its classified budget of $7 million, a secret headquarters in Arlington, Virginia, and cover name, the Tactical Concept Activity. ISA included three main operations branches (Command, SIGINT and Operations), and an analysis branch, whose name changed over the years (e.g. Directorate of Intelligence, Directorate of Intelligence and Security). Colonel Jerry King became ISA's first commander. ISA mission was to support top-tier Special Operations Forces (primarily Delta Force and SEAL Team Six) in counter-terrorist operations and other special missions. The ISA would provide actionable intelligence collection, pathfinding, and operational support. The ISA performed several operations mainly in Latin America and the Middle East, but also in East Africa, South-East Asia, and Europe. The current organization of ISA is classified but does contain three squadrons (Operations, SIGINT and Mission Support). On December 17, 1981, the senior U.S. Army officer in NATO Land Forces Southern European Command, Brigadier General James L. Dozier, was kidnapped from his apartment in Verona, Italy, by Italian Red Brigades terrorists. The search for General Dozier saw a massive deployment of Italian and U.S. forces, including thousands of Italian national police, the Carabinieri. The search also featured some unconventional participants, including "remote viewers" from Project Stargate and an international cast of psychics, largely orchestrated by General Albert Stubblebine, then-Commander of U.S. Army Intelligence and Security Command INSCOM, and a great believer in the use of unconventional intelligence-gathering methods. An ISA SIGINT team was sent to Italy, and in conjunction with other Army SIGINT and counter-intelligence units, employed aerial and ground-based SIGINT systems to monitor and geo-locate terrorist communications. ISA and the other Army elements provided useful intelligence, helping Italian police to arrest several Red Brigades terrorists in mid-January 1982. The Italian police and intelligence agencies have never officially disclosed how they located General Dozier in late January 1982. However, U.S. Army participants in the operation have hinted that the mid-January arrests, the interrogation of those arrested, and follow-on investigations led to the eventual location of the Red Brigades hideout where Dozier was being held, in an apartment over a store in Padova. There is little doubt that the successful outcome resulted in part from the contributions of ISA's SIGINT specialists and the other supporting Army intelligence elements. General Dozier was freed unharmed by NOCS operators, also known as "The Leatherheads" for their unique headgear, on January 28, 1982. In early 1982, the ISA was needed to support a SIGINT mission in El Salvador, a mission that the CIA, the NSA and INSCOM were not able to accomplish. The task was submitted to the U.S. Army Special Operations Division (SOD), which started Operation Queens Hunter. Operating from a Beechcraft model 100 King Air flown by SEASPRAY (a clandestine military aviation unit) based in Honduras, ISA SIGINT specialists monitored communications from Salvadoran leftist guerrillas and fascist death squads, providing intelligence which helped the Salvadoran Army defend against guerrilla attacks. The success was such that the operation, planned to last a month, ran for more than three years. More aircraft were deployed, and eventually included eavesdropping on Honduran guerrillas too, as well as Nicaraguan Army units fighting against the Contras. The ISA has also conducted an operation to search for U.S. MIAs (soldiers reported as Missing In Action) allegedly held in South-East Asia in secret POWs camps in the 1980s. In 1979, U.S. intelligence thought it had located a POW camp in Laos using aerial and satellite photographs. A ground reconnaissance was needed to determine if people seen on photographs were really American POWs. At the same time, former Special Forces Major James G. "Bo" Gritz planned a private rescue mission with other S.F. veterans. Having informed U.S. government officials about the mission, Bo Gritz was first told to abort his "mission," but was eventually approached by the ISA. Nonetheless, Gritz was not believed to be doing serious work, and Pentagon officials ordered the ISA to terminate their relationship with him when they discovered that ISA had provided him with money and equipment. Gray Fox was the codename used by the ISA at the beginning of the War in Afghanistan. Its members often worked closely with US Special Mission Units and the Central Intelligence Agency. In 2002, Gray Fox fought alongside Delta Force and DEVGRU in the mountains of Afghanistan. Gray Fox operatives intercepted enemy communications and trekked to observation posts with special operations units. Their efforts may have saved more than a hundred 10th Mountain Division and 101st Airborne Division soldiers fighting near Takur Ghar in Afghanistan's Shahikot Valley during Operation Anaconda. The unit helped spearhead the search for Saddam Hussein and his family after the U.S.-led invasion of Iraq in 2003. Gray Fox operatives sometimes work under the broader umbrella of "Joint Special Operations Task Force 20", which also included DEVGRU, the Army's Delta Force, and 160th Special Operations Aviation Regiment. Saddam Hussein was eventually captured during Operation Red Dawn. Under the command of Colonel Michael K. Nagata from 2005 to 2008, Gray Fox continued to operate in Iraq and Afghanistan alongside US Special Operations Forces. To this day, the term "Task Force Orange" is used when referring to the unit's reinvigorated new role as not just intelligence gathering, analysis, support etc. for other Tier 1 Special Mission Units but also as an element capable of doing similar skillset-related taskings such as direct action or hostage rescue. The very notion that ISA is able to put together actionable intelligence demonstrates it has surpassed all other Special Mission Units in JSOC when it comes to being "first in, last out" in numerous countries it works in today, and in numerous articles and recent books, such as Sean Naylor's "RELENTLESS STRIKE" it is explained in even greater detail on why this unit's importance was so imperative. In 2003, the Intelligence Support Activity was transferred from the Army to Joint Special Operations Command, where it was renamed the Mission Support Activity. Since 2005 onward, the ISA has not always operated under a two-worded Special Access Program (SAP) name (Grey Fox, Centra Spike, etc.). In 2009, the unit was referred to as INTREPID SPEAR, until this was revealed to have been leaked in an email to the Pentagon. In 2010 it was referred to as the United States Army Studies and Analysis Activity. Elements of the former ISA assisted in intelligence collection and analysis operations prior to and during the 2 May 2011 U.S. Special Operations Forces mission which resulted in the death of Osama bin Laden. Elements of DEVGRU, along with the ISA, members of the CIA Special Activities Division, DIA, and the NSA combined to execute a raid in Abbottabad, Pakistan, which ultimately killed bin Laden and resulted in the deaths of several family members and associates. According to Sean Naylor in Not a Good Day to Die, most (but certainly not all) Activity operatives come from United States Army Special Forces, due to their self-reliance and specialized skill-set. Candidates also come from the other military branches. Most candidates assigned to the Operations and SIGINT squadrons go through an assessment and selection course, as well as a lengthy background investigation and psychological testing. Once admitted, they receive further training in a specialized Operator Training Course. Like all units, this Special Mission Unit contains operational detachments as well as support detachments. Candidates must have previous training in tactics, such as CQB, sniper, counter-sniper, and source development. Foreign language skills, although highly desired, are not a prerequisite to becoming a member of the ISA, though to be a SIGINT/HUMINT operator in the field with other Special Mission Units, working clandestine operations in non-permissive environments, knowing a minimum of several languages is usually indispensable (e.g. Persian, Arabic, Pashto, etc.). Some of the disciplines focused on in the training course are: infiltration techniques, advanced air operations, professional driving (offensive and off-road), personal defensive measures, and state-of-the-art communications, deep surveillance, tradecraft, weapons handling, hand-to-hand combat, signals intelligence, etc. Robert Littell's 1991 novel An Agent in Place. W. E. B. Griffin's The Presidential Agent series, especially the first book, By Order of the President, which features "Gray Fox" in a major role. However, they are portrayed as a top secret unit within Delta Force. In Dale Brown's Patrick McLanahan novels, the ISA operates on the high seas in support of McLanahan's operations in Flight of the Old Dog. In Mark Bowden's 2001 book Killing Pablo, ISA operators ("Centra Spike") play a significant role in the hunt for fugitive drug lord Pablo Escobar of the Medellín Cartel leading to his death in December 1993 at the hands of Search Bloc, a Special Operations unit of the National Police of Colombia. In Daniel Suarez's 2012 novel Kill Decision, a team of ISA operators is trying to unravel a conspiracy involving autonomous aerial drones. Nathan Edmondson's and Mitch Gerads' comic The Activity. Former intelligence advisor and thriller author, J.T. Patten's Task Force Orange novels are based on the Intelligence Support Activity with accolades and book reviews by Nathan Edmondson, Mitch Gerads, Michael Smith and Sean Naylor. The series underwent pre-publication reviews by the CIA, NSA, and DOD due to his prior intelligence work. ^ Naylor, Sean. Relentless Strike. ISBN 1250105471. ^ Clancy, Tom (2001). Special Forces. New York: Berkley Books. ISBN 0-425-17268-6. ^ a b Sean Naylor (2006). Not a Good Day to Die: The Untold Story of Operation Anaconda. New York: Berkley Books. ISBN 0-425-19609-7. ^ Littell, Robert (2005). An Agent in Place. Penguin Books. ISBN 0143035649. ^ Griffin, W. E. B. (1 December 2005). By Order of the President. Jove Books. ISBN 0515139777. ^ FitzSimmons, Matthew (2015). The Short Drop (The Gibson Vaughn Series). Thomas & Mercer. ISBN 9781503950252. ^ Brown, Dale (1987). Flight of the Old Dog. D.I. Fine. ISBN 1556110340. ^ Bowden, Mark (2002). Killing Pablo: The Hunt for the Richest, Most Powerful Criminal in History. Atlantic Books. ISBN 1903809487. ^ Suarez, Daniel (2013). Kill Decision. Penguin Group (USA) Inc. ISBN 0451417704. ^ Truitt, Brian (11 January 2012). "'The Activity' aims for realism with its government intrigue". USA Today. Retrieved 14 July 2014. ^ Delta Green: Agent's Handbook. Arc Dream Publishing. 2016. ISBN 1-940410-21-5.